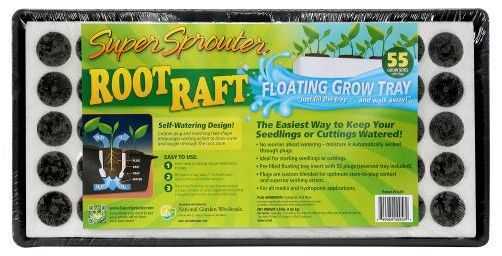 The Super Sprouter® Root Raft® is designed to be a self watering starter tray. Root Raft® includes a 10 x 20 inch tray for holding water and a styrofoam 55 site floating insert loaded with Super Sprouter® custom blended and custom sized grow plugs. Mother Earth® BioChar added to this exclusive formulation. No worries about watering  moisture is automatically wicked through the plugs. Floating grow tray! Just fill the tray and walk away. If you desire a mini greenhouse effect, you can use any of the Super Sprouter® domes to get the job done. Domes sold separately.